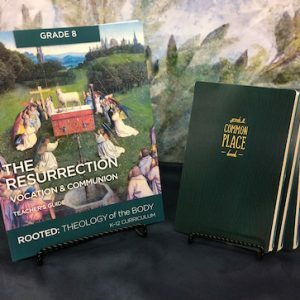 Literature-based materials to bring Theology of the Body to life for fifth graders. Set includes 4 items: D’Aulaires’ Book of Greek Myths and companion Teacher’s Guide. Plus an Original Nakedness Teacher’s Guide (and materials) for exploring readings from your classroom or family Bible. Part of the ROOTED: Theology of the Body K-12 Curriculum. 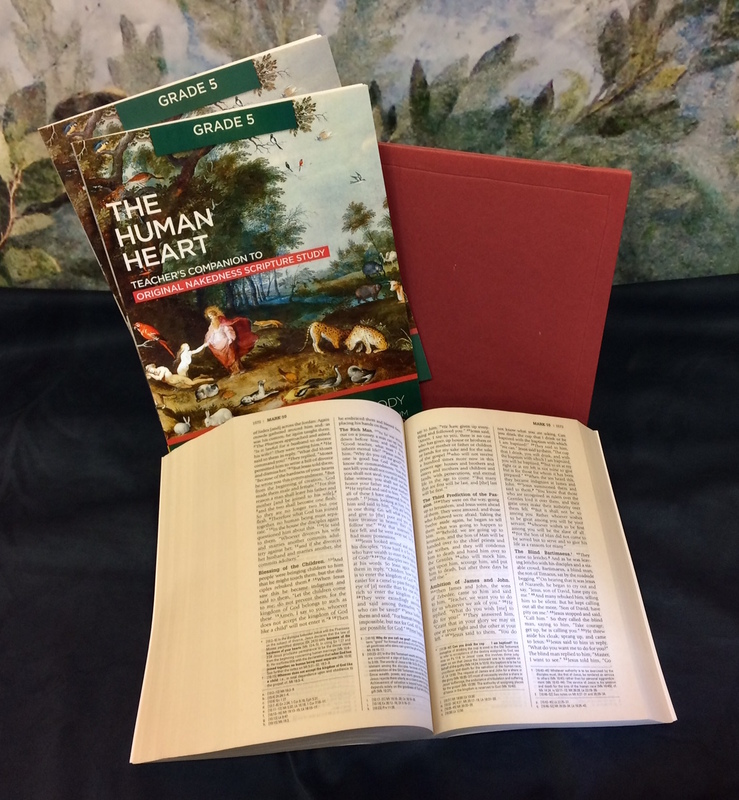 The elementary school material is literature-based, using richly illustrated stories to delve deeper into the foundational concepts of Theology of the Body – what it means to be human, how to live as a gift to others, what it means to have heaven as our ultimate destiny. We offer Teacher’s Guides to introduce many hands on activities to embody this discovery for young learners. As part of the Grade 3-5 experience, we enable students a view into the Bible you use and cherish, to establish the tradition of learning personal inspiration from the Word of God. 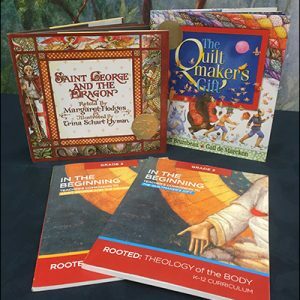 Literature-based materials to bring Theology of the Body to life for fourth graders. 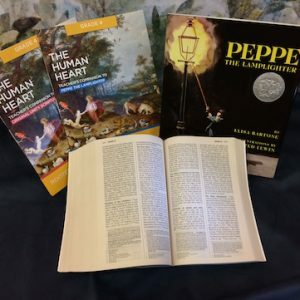 Set includes 4 items: Peppe the Lamplighter and Teacher's Guide. Plus an Original Unity Teacher's Guide (and materials) for exploring readings from your classroom or family Bible. Part of the ROOTED: Theology of the Body K-12 Curriculum. Literature-based materials to introduce Theology of the Body to second graders. Set includes St. George and the Dragon. The Quiltmaker's Gift. And Teacher's Guide for each. Part of the ROOTED: Theology of the Body K-12 Curriculum. Literature-based materials to introduce Theology of the Body to Kindergarteners. 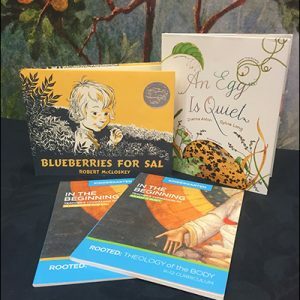 Set includes Blueberries for Sal, An Egg is Quiet, and Teacher’s Guide for each part of the ROOTED: Theology of the Body K-12 Curriculum. The goal in our ROOTED: TOB Middle School series is to present these units in a way consonant with the thought and approach of John Paul II. The themes of his Theology of the Body will not only appear in the content but also the form or way in which it is taught. Pre-Order your books now for delivery in October 2019 . Purchase a (non-consumable) Teacher's Guide for each educator and one (consumable) Common Place Book per student. Part of the ROOTED: Theology of the Body K-12 Curriculum.